The English in their empire conquests to India and Pakistan brought the game of cricket in their armory, best understood as complicated. With the pavilion hosting tea, the sound of the leather ball on the willow bat soon spread across the verdant lands of the subcontinent. The locals embraced a game played by spectacularly white men with unimpeachable manners, in spectacularly white clothes. Today, India and Pakistan are as mad for cricket as they are for being at each others nuclear throats. Cricket has helped keep the peace by allowing Indians and Pakistanis to throw cricket balls at each other. But while democratic India has become a stage for Western capital and its values, Pakistan sinks deeper into a sticky wicket of terrorism, biblical style floods and now something disabling and disastrous for the nation’s identity — the Pakistani national cricket team, the pride of the nation, have been caught red handed in a betting scandal that has knocked the tea cups off the saucers, spoiling the cucumber sandwiches. Currently, Pakistan is playing England at the home of cricket in London, a sporting venue grandly named Lords. 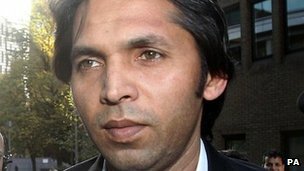 Over the last weekend, a national UK newspaper revealed a sting operation conducted by undercover journalists, who paid a man around $250,000 for information on when certain Pakistan players on the field were going to cheat. The operative, it is claimed, is linked to illegal gambling syndicates. Sure enough, the players cheated on cue and the sounds of the London bobbies running to catch the villains came shortly after. Now, the Pakistanis require something slightly stronger than tea — high powered lawyers will be a start, maybe a stolen plane to make their getaway. 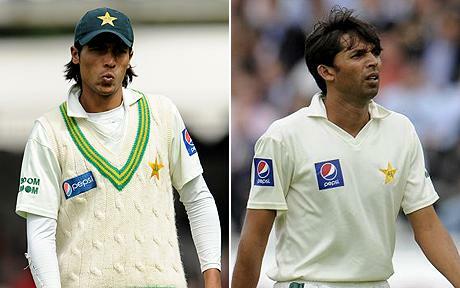 For years, Pakistani cricket has been suspect. Investigators in the past were stumped and failed to prove what seemed obvious to any sentient viewer — Pakistan was cheating, throwing games to cash in on payments from gambling crime, the cricket version of baseball’s Black Socks. Pakistan has been on the back foot over the claims denying it as a conspiracy against them. But this scandal has bowled them out. The News of the World has all the evidence on videotape. It’s irrefutable — in flagrante delicto. The London police and cricket’s governing authority are using much diplomatic nuance at this stage of the criminal investigation, Only recently, the British Prime Minister David Cameron insulted Pakistan while he was visiting their enemy, India. And now this! Cheats at Lords, the home of English cricket. This stain on the linen will provide more ammo for the prejudice merchants loading another flare to fire at poor old Pakistan — how can you trust them? Should Pakistan be banned from international cricket, somewhat unlikely but possible if the poison goes all the way to the top of their game, the impact back home will be enormous. For millions of Pakistanis, cricket is more important than life or death. It is Pakistan’s rope to the world. A chance to show how great they are at a tremendously demanding and skillful sport. Add one more disaster to a nation seriously down on its luck.